Today’s blogger is Lieutenant Colonel Philip Smith, whose nearly 25-year career with the United States Marine Corps inspired his second career—teaching. iteachLOUISIANA appreciates Col. Smith’s service and his willingness to share his story. I viewed it as more of a challenge and an opportunity to serve my country and fly. I drifted somewhat during this period, not really knowing what I was going to do when my contract was up. Then 9/11 happened and changed everything as I am sure it did for many people. During my last tour with this squadron, I volunteered to be a Forward Air Controller (FAC) and received orders to serve with an Infantry Battalion out of 29 Palms, California. We deployed to Iraq in January of 2003. As a Company, Platoon and Squad/Team level-FAC, I was primarily responsible for calling in air strikes, MEDEVACS and close air support. This tour was my first combat tour, and changed my life forever. I now knew why we as Marines trained so hard, and why the Marines have the reputation they have. But just as important, I knew that I wanted to stay a Marine. Ten months later we returned home in October 2003. After this tour, I was lucky enough to receive orders back to Pensacola, FL to serve as a Flight Instructor as well as teach aerodynamic courses at the school house, which gave me considerable classroom teaching experience. After a blissful 2 1/2 year tour in Pensacola, I received orders back to the Fleet as a MEDEVAC pilot with the squadron HMM-364, the “Purple Foxes.” I served with the Purple Foxes for 2 combat tours in Iraq and held various leadership positions as Aircraft Maintenance Officer, Director of Safety and Standardization and for a brief period as the Executive Officer. Additionally, I trained for and served as a Weapons and Tactics Instructor (WTI) as well as a Flight Leader. It was during my experiences as a Flight Instructor as well as a WTI that I developed a passion for teaching. Upon completing my final combat tour, I returned home and received orders to New Orleans, LA to serve at the Marine Forces Reserve Headquarters as well as a tour with the 4th Marine Aircraft Wing. Fortunately for me, these two units are co-located so I was able to stretch out my last years in the Marine Corps in New Orleans. 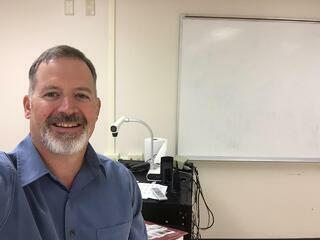 After almost 25 years with the Marines, I retired as a Lieutenant Colonel and knew that I wanted to pursue a civilian career in teaching; preferably at the high school level teaching social studies. For me, teaching is a calling, much like the Marines. The investment in the future generation of Americans is paramount to anything else we can do as citizens. This is the primary reason I want to teach. The secondary reason is that I really enjoyed it during my classroom time in Pensacola, much more so than I anticipated. I knew right after the first couple of classes teaching aerodynamics that I had found something other than flying that I truly loved. Put simply, iteach has been a blessing; it has enabled me to pursue my second career with an informative and very accessible program. In addition and just as important, the professionalism of my instructors and support staff at iteach is on par with what I am used to from the Marines. They have always been prompt, courteous, respectful and very attentive to my needs as a student. When I was researching all the alternative paths for certification for my state of Louisiana, I continually read great reviews about iteach and now I know why. They are simply the best program available. In fact, when I got hired on at my new school district, the superintendent of hiring remarked that he has had a few iteach instructors and thought very highly of them. So, for all this, THANK YOU ITEACH!